Beda Hallberg created the Swedish förstamajblomma (First of May Flower) as a way to collect money to beat tuberculosis. The flower sales were extremely lucrative. Beda Hallberg was born in 1869 and grew up in the countryside of northern Halland. Her father was a sea captain who set off for America when she was only one year old. He never returned. Although Beda Hallberg and her mother lived under tight economic conditions, her mother always made sure to help poor and sickly neighbours. Beda Hallberg was also involved in these acts of kindness. In 1888 Beda Hallberg, then aged 19, married a businessman from Gothenburg, where they settled together. She continued to be active in charitable work. She made home visits under the auspices of the cathedral congregation, and frequently witnessed the impact of tuberculosis on children and young adults in particular. She soon realised how important it was to focus on preventative measures to fight the disease. It was Margot, Beda Hallberg’s daughter, who gave her the inspiration for the May Flower (originally called First of May Flower). On Gustav Adolf day – November 6 – 1906 Margot came home wearing a small paper shield pinned to her buttonhole. This inspired the May Flower, which was first sold in Gothenburg on 1 May 1907, coloured blue. It was a great success and resulted in 139,000 flowers being sold, far exceeding Beda Hallberg’s expectations. Göteborgs Handels- och Sjöfarts-Tidning enthusiastically reported on the “victory” of the blue flowers, and how the whole city was happy to wear one. Beda Hallberg was a skilful organiser who well understood the importance of good publicity. This was crucial for the local, national and, eventually, international success of the May Flower. The May Flower association Förstamajblommans Riksforbund was established by 19 May 1907 with its base in Gothenburg, where Beda Hallberg was a member of the board from the outset. In 1937 she was appointed honorary member of the association. Several local May Flower committees were subsequently set up across the country. It was largely teachers and students who sold the flowers. During the 60-year period from 1907 to 1967, almost 60 million kroner were raised. During the following years thousands of Swedish children received an opportunity to improve their physical health by attending summer camps funded by the May Flower. Beda Hallberg herself worked at a holiday home for middle-class girls in Hällingsjö in Västergötland. She ran the home from 1924 to 1942. Beda Hallberg and the May Flower soon were noticed in other countries. The May Flowers were sold throughout the world, from the USA, to India and Cuba, as well as in neighbouring Nordic countries and in several European countries, particularly during the interwar period. This success was largely down to Beda Hallberg’s own engagement at an international level. By 1909 she was already serving as the corresponding member of Internationella föreningen mot tuberkulos (the International Union Against Tuberculosis). In 1913 she was made an honorary member of Norske Kvinners Sanitetsforening (Norwegian Women's Public Health Association). That same year she attended an international conference on tuberculosis in Berlin. In 1931 she visited the Swedish areas of the USA and also opened a hospital pavilion in Denver. The opening of that particular tuberculosis ward was financed by funds collected through May Flower sales. She also received several American awards as an honorary member of Majblomman Corporation of America. During her lifetime Beda Hallberg received a lot of recognition for her efforts, including several honorary memberships and awards. She had already been given the royal Illis quorum medal of the eighth degree in 1914, and in the early 1930s she was awarded the St. Erik Order of the Vasa as well as a medal of merit from King Kristian X of Denmark. Beda Hallberg was also active in pension issues. She was a member of Gothenburg pension board. 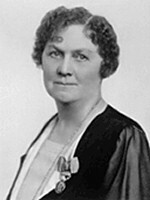 As the result of a cross-party motion in parliament she became entitled to an honorary pension from 1938. The only other Swedish woman to receive this before her was Hedvig Charlotta Nordenflycht, who was awarded the same in 1752. This must be seen against the background of her voluntary and not-for-profit work, which in all likelihood was almost entirely unpaid. The decision to award her a pension was probably also made on the basis that she became a widow in 1938. With “förstamajblomman” (First of May Flower) Beda Hallberg created a still extant trademark, which since 1998 has gone under the name “majblomman” (May Flower). Beda Hallberg is still remembered. In 2004 she was voted the top individual from Halland. Further, a high school in Kungsbacka has been named after her, and in Gothenburg she has had a tram named after her. The May Flower continues to be sold, although the funds generated by the flowers now go towards different causes, such as research and summer camps for children. Beda Hallberg died in Stockholm in 1945. She is buried in Östra cemetery in Gothenburg. Beda Sofia Hallberg, www.skbl.se/sv/artikel/BedaHallberg, Svenskt kvinnobiografiskt lexikon (article by Ann-Katrin Hatje), retrieved 2019-04-22.